Scouting can build a character especially for the boys. Teachers have capability to do it. 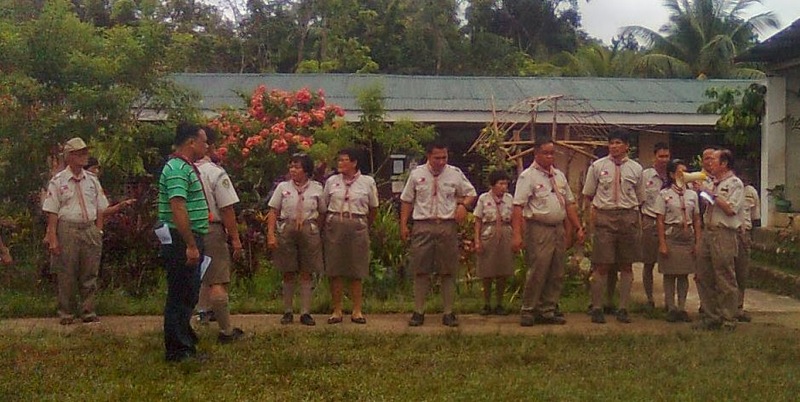 Thus, they need to be trained in scouting to make an exemplary scout from their pupils or students. Scouting as it has been known by the leaders in the said prestigious international and well-respected organization, it is not a science that has to be "solemnly" studied nor it is a set or collection of doctrines and texts. 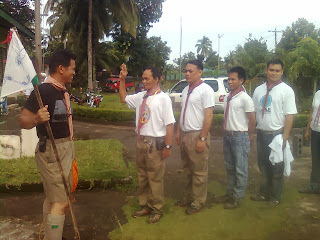 This a line for the task given me as one of the support staff of the recent basic training course for leaders like outfit, troop, kawan and lakay of the Boy Scout of the Philippines held at the Haguimit Elementary School, Division of La Carlota City. 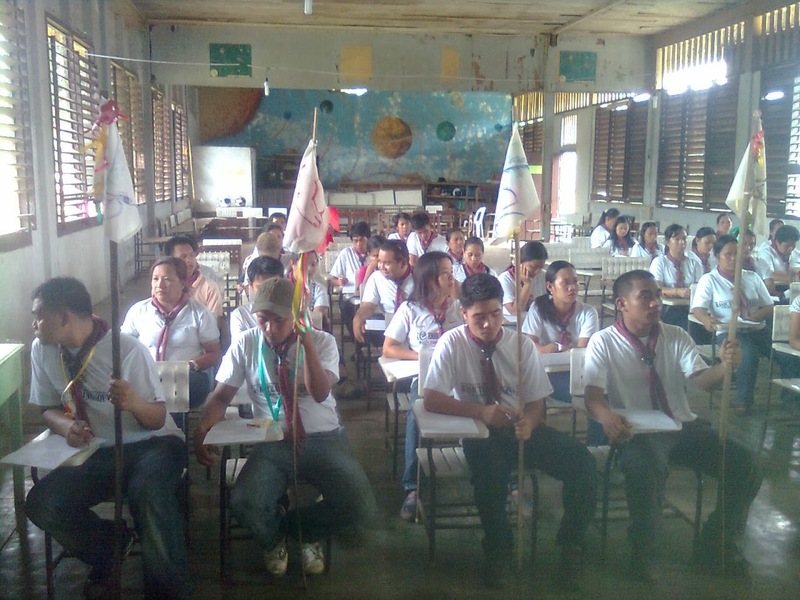 "What is scouting?" is one of those evaluation questions for all trainees before they share their talents of songs and yells, and a skit. They have to undergo basic practical obstacles and have to answer three questions satisfactorily as an application of what they have learned from the 3-day training. Fifty eight elementary and high school teachers were able to satisfactorily completed the required training. Three of which are trainees coming from the municipality of La Castellana, Negros Occidental, and 2 come from the municipality of Isabela, Negros Occidental; and the rest are from the division of La Carlota City. 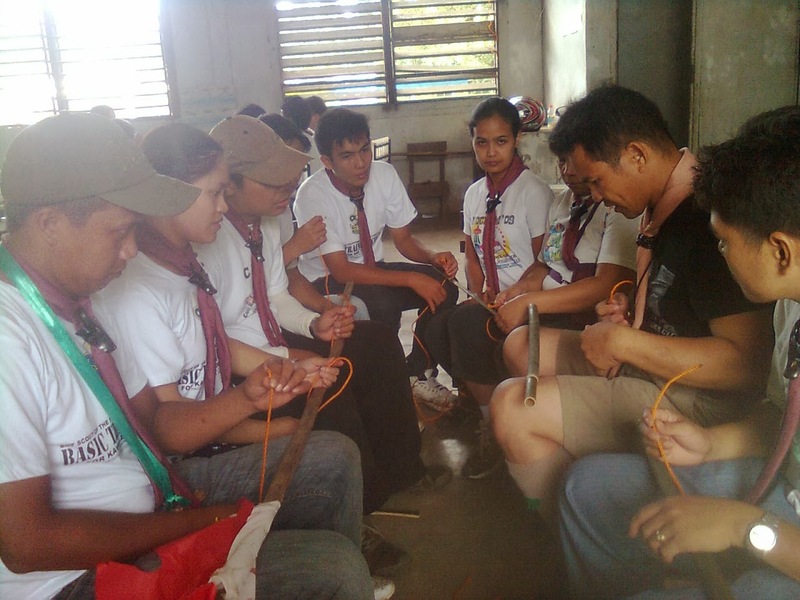 They were trained on the importance of scouting as a contributory factor to the solution of the problem of Philippine society, making a workable plan in charging their responsibility as a scout leader, coming up with an effective plan for the character building of a boy, and also an outward concern or commitment by applying the method and principles of the Boy Scout of the Philippines. 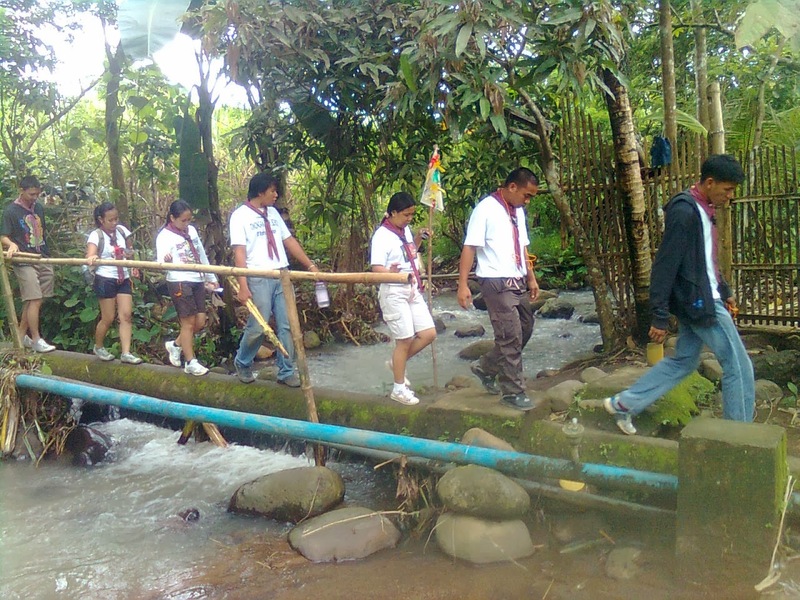 Scouting is the first emphasis on this training. And the second is focused on the basic training course for the leaders like the smartness and good order, developing basic skills, holding a campfire, learning worthwhile games, songs and yells, the badge system, the required meeting and its frequency; and of course, learning by heart the scout oath and law. "In my honor, I will do my best, to do my duty, to God and my country, the Republic of the Philippines; to help other people at all times, to keep myself physically strong, mentally awake and morally straight." 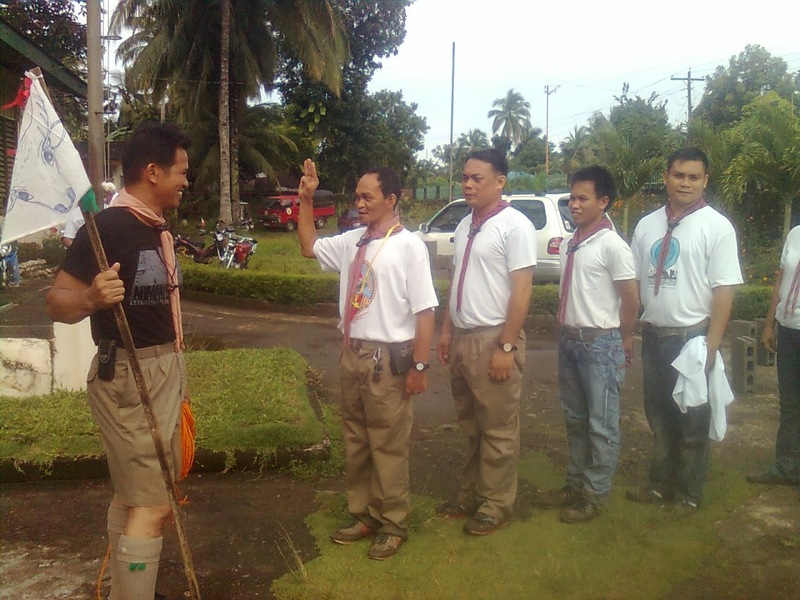 Scout is trustworthy, loyal, helpful, friendly, courteous, kind, obedient, cheerful, thrifty, brave, clean, reverent. Scouting is "fun, camaraderie, challenging, sacrifice, social gathering, adventure, thrilling, enjoyable, character building, unity, friendship... love of God, love of country, and love of fellowmen,,,"
Scouting in its simplest terms is service, companionship or camaraderie, and outing. The volunteer trainors and the support staff come from Bago City, San Carlos City, Sagay City, La Carlota City, and from the Negros Occidental BSP Council. Ma. Rosario F. Gangoso, course leader; Ana Liza T. Carmona, Miriam Barrera, Ramy Pahilga (SPL), Imelda Escobar, Rebecca A. Acotanza, Celedonia Cañal, Rodel G.Cabalatungan (FSE), and Romeo B. Toda (course consultant). 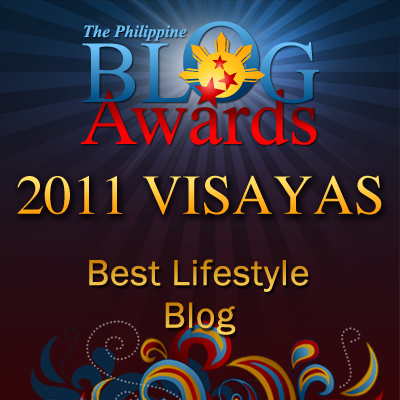 Alejando Ticao (course leader), Melgar Coronel, Ramy Gayadao, Revilyn Solomon, Bonard Supe (SPL), Mark Tompong, Sheila Mayonila, Gemima Obelidon, Norma Salazar, Phoebe Camilo, Teresita Espartero, Tracy Hiceta, Gilbor Camporazo (the author/blogger), Melvin Medina, Dharyll Ladera, Ma. Cecil Peñola, Roberto Maguad (course coordinator), Sol Moleta and Aquino Torrefranca (course consultant). I got acquainted with Jabbar Mahusay, one also of the support staff from the council. He handled the flag courtesy station. A strong advocate of scouting, a dedicated support staff, very willing to learn more as I observed him. Our acquaintance was short lived. I also noticed another support staff, Roque Eduardo of the council. He was assisting ALT Ramy Gayadao in lashing making section. Both Jabbar Mahusay ang Roque Eduardo are from Sagay City. I was a Boy Scout in high school. We had interesting activities, although I never did like going camping (up to now). I wonder if my old school still offers scouting up to now. My kid's school now does not. 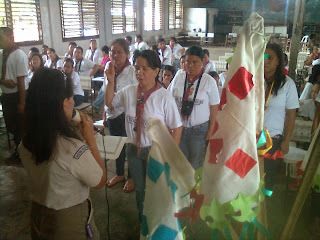 It's nice that the teachers did undergo scout training. I remember being a boy scout and its one of a highlight in a boy's life so it really helps that the teachers are experienced. This is so interesting to know. I wasn`t familiar with scouting because my schools before didn`t offer them. Being a girl or boy scout seems like a great experience for students. Scouting is different from soldier training, right? The volunteer trainors are admirable and they must be a source of inspiration of these participants. The Girls Guides and the Boys Scouts have been a universal symbol of service and comradeship for decades. I'm glad it is thriving in your area too. I used to be a Brownie Mom and had a lot of fun training and working with my charges. I think kids in this generation will benefit from scout training, many are too babied and parents are not interested as they feel their kids do not need survival training. I'm glad to see that these teachers are passing on the baton to others.